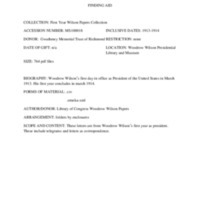 Photocopies of Wilson's correspondence during his first year of administration from the Library of Congress microfilm. Woodrow Wilson’s first day in office as President of the United States in March 1913. His first year concludes in March 1914. These letters are from Woodrow Wilson’s first year as president. These include telegrams and letters as correspondence. Woodrow Wilson Presidential Library & Museum staff, “First Year Wilson Papers Finding Aid,” 1913-1914, FA100018, First Year Wilson Papers, Woodrow Wilson Presidential Library & Museum, Staunton, Virginia.